NF Protein specializes in high quality animal feed ingredients with applications across a wide spectrum of animal diets. We strive to enhance our products through research, laboratory testing, and continuous innovation. NF Protein is proud to have earned a reputation as a worldwide leader of peptide feed ingredients for livestock diets. We offer both high quality soy-based proteins and excellent, biologically safe animal proteins. DPS® is the world´s leading animal-based peptide for inclusion in young animal diets as a functional, high-quality source of amino acids. It is the co-product of enzymatic hydrolysis of porcine intestinal mucosa for the production of heparin in the human pharmaceutical industry. After hydrolysis and heparin extraction, the liquid protein is concentrated and gently dried. What is a functional peptide? A functional peptide is a protein ingredient that provides a specific value added benefit beyond supplying digestible amino acids to the diet. Research has shown that besides being a high-quality peptide source, DPS stimulates gut development in young pigs. In a trial comparing DPS to fishmeal and plasma, piglets fed DPS had equal villus height: crypt depth measurements as pigs fed plasma and significantly better than piglets fed high-quality fishmeal. Why are peptides important in young animal nutrition? The digestive system in the young animal is immature. Research has shown that peptides are more readily digested and absorbed than free amino acids or intact proteins. For more information, review DPS Technical Bulletin 21. Has NF Protein conducted research trials to evaluate DPS? Yes. Over 40 university and field trials have demonstrated the efficacy of DPS relative to other protein ingredients. 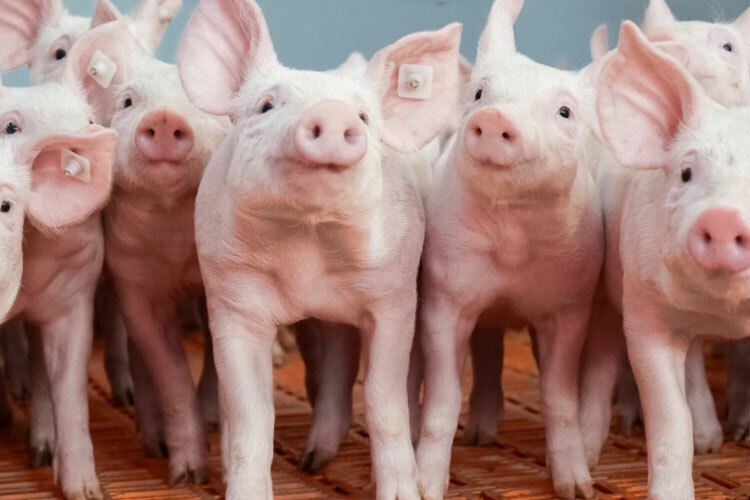 Studies have shown that weanling pigs fed DPS outperform pigs fed fish meal or spray-dried blood cells, in terms of average daily gain and feed efficiency. DPS also replaces plasma in phase 2 piglet diets while maintaining performance and reducing cost of weight gain. How do you use DPS in a piglet diet? Include in the diet of weanling pigs at 3-4% at the expense of fishmeal, spray-dried blood cells or plasma or include in addition to these ingredients at the expense of soybean meal. Are there other applications for DPS? DPS has been used in lactating sow diets, poultry diets, aquaculture, and canine diets. For more information about using DPS in your animal diets or for help formulating a custom diet including DPS, please contact us. UltraMannan is a high quality source of beta glucans and complex mannans from primary food grade grown yeast. Research has shown that the inclusion of complex mannans in piglet, sow and poultry diets improves gut health by preventing colonization of harmful microorganisms. Laboratory analyses indicate that UltraMannan contains 20% more complex mannans than the major competitor’s product. Research also indicates that UltraMannan out-performs the leading competitor’s product. What are the benefits of feeding UltraMannan 120? UltraMannan 120 contains complex mannans. Research trials have demonstrated improved performance in various animal species when complex mannans were included in their diets. Research has shown that dietary beta glucans can improve immune response in young animals. UltraMannan 120 contains high levels of beta glucans. What differentiates UltraMannan 120 from the leading competitor's product? According to a laboratory analysis conducted by Dr. George Fahey at the University of Illinois, UltraMannan 120 contains 20% more complex mannans than the competitor’s product. Laboratory analyses have shown that UltraMannan 120 contains over 80% more beta glucans than the competitor’s product. How does UltraMannan perform in animal diets relative to the major competitor's mannan product? Research by Dr. Hans Stein of the University of Illinois demonstrated that piglets fed UltraMannan 120 exhibited significantly higher average daily gain than pigs fed the competitor product. The piglets fed UltraMannan had improved average daily feed intake relative to the piglets fed the competitor product. What is the inclusion rate for UltraMannan 120? Include in the diet at 0.1% to 0.3% of the complete diet. Include in swine, ruminant, poultry and pet diets. Our products are subjected to extensive research and continuous laboratory monitoring, staying on the leading edge and ensuring the highest standards of quality. NF Protein is regarded as an industry leader in peptide protein nutrition with a worldwide reputation and longstanding tradition of excellence and innovation. Since 1928, NF Protein has been an innovator in the field of crop and animal nutrients. Our family of Sioux City based companies has expanded over that period to include six manufacturing facilities, producing everything from liquid fertilizers to mineral blocks to animal feed ingredients. NF Protein specializes in high quality peptide proteins and value-added feed ingredients for animal diets. Contact us today at customersupport@kaydeellc.com to receive a copy of the research. Mannan Comparison: Comparison of Complex Mannan Levels of Three Yeast Products, mg/g. Technical Bulletin 2: DPS 50RD proved to be an effective replacement for soybean meal in baby pig starter rations. Technical Bulletin 3: Baby pigs fed starter diets in which DPS 30 replaced dried whey significantly outperformed those fed a control diet. Technical Bulletin 3a: Baby pigs fed a starter diet with DPS significantly outperformed those fed a control diet with dried whey. Technical Bulletin 4: Condensed Porcine Solubles® 21% Amino Acid Profile. Technical Bulletin 5: DPS Products Typical Energy Values. Technical Bulletin 8: Product Stability and Shelf Life. Technical Bulletin 9: Young pigs on diets with DPS 30 had similar performance to those on diets with dried whey and spray dried plasma. Technical Bulletin 11: Baby pigs fed starter diets with DPS 30 gained more weight than those on a control diet with dried whey. Technical Bulletin 13: Young pigs on diets with DPS 30 had better performance than those on diets with just spray dried plasma, and dried whey. Technical Bulletin 14: Young turkeys on diets with DPS 30 had similar performance to those on diets with menhaden fish meal, and outperformed poults fed a corn, soybean meal, control starter diet. Technical Bulletin 15: CPS 21 could be used to supply a portion of the supplemental protein, potassium and phosphorus for finishing steers. Technical Bulletin 16: Nursery pigs provided feed containing 3% DPS 30 had similar performance to those on 3% plasma, pigs given feed containing 6% DPS 30 had better performance to those on feed containing 6% plasma. Technical Bulletin 17: CPS 21 can be used to cost effectively replace high protein (48% protein) soybean meal (SBM) in swine growing and finishing diets. Technical Bulletin 18: Poultry Amino Acid Digestibility Test by University of Missouri. Technical Bulletin 19: DPS 30 tested equivalent to Spray Dried Blood Cells (SDBC). Nursery pigs fed DPS 30 had equal ADG and better feed efficiency compared to pigs on SDBC. Technical Bulletin 20: The inclusion of 5.0% or 6.68% DPS 30 in phase 1 diets produces similar results as compared to diets containing SMFM and spray dried plasma protein. Technical Bulletin 22: Neither DPS 30, DPS 50RD or Menhaden fish meal (MFM) provided an advantage or disadvantage over a standard corn/soybean meal diet. Technical Bulletin 23: 21 day weaned pigs preferred starter feed containing 2.5% DPS 30, over starter feed with no DPS 30 by a ratio of 4-to-1. Technical Bulletin 24: A preference (choice) feeding trial was conducted in October, 1998, by Dr. Merlin Lindemann at the University of Kentucky. The trial tested weanling pigs preference for diets containing either 2.5% or 5.0% DPS 30. Technical Bulletin 25: Twenty-day weaned pigs preferred a starter feed containing a combination of 2.5% DPS 30 and 2.5% plasma over a starter feed containing only 5.0% plasma by a ratio of 3-to-1. Technical Bulletin 26: A preference (choice) feeding trial was conducted in December, 1998, by Dr. Merlin Lindemann at the University of Kentucky. The trial tested weanling pig’s preference for diets containing either 3.0% DPS 30, or 1.5% DPS 50RD. Technical Bulletin 27: DPS 30 had similar overall performance when compared to spray dried plasma protein (SDPP) in SEW diets and spray dried blood meal (SDBM) in Phase 1 diets. However, the DPS 30 diets had a lower cost of gain compared to spray dried plasma protein and spray dried blood meal diets. Technical Bulletin 28: DPS 30 was an effective replacement for select menhaden fish meal (SMFM) in phase 1 swine nursery diets. A new more concentrated DPS product, DPS 50RD, was also tested. Technical Bulletin 29: The inclusion of 3% DPS 50RD (45% crude protein) significantly increased feed intake and daily gain by 5-12% depending on the ingredients of the control diet. Technical Bulletin 30: Pigs fed diets with 5% DPS 30 consumed more feed, grew faster and had significantly reduced diarrhea scores. Technical Bulletin 31: DPS 50RD and DPS 30 treatments had similar ADG, ADFI and F/G at week 5 to the Plasma protein treatments and better performance than the Fishmeal control diet. There was a high correlation between diarrhea index (DI) and performance with DPS and plasma having significantly lower DI than the control. Technical Bulletin 32: Examining the digestive enzyme activity and intestinal morphology of nursery pigs receiving various proteins (fishmeal, DPS and plasma). There was no significant difference in enzyme activity among various proteins. DPS and plasma did stimulate villus growth and crypt cell development of nursery pigs. Technical Bulletin 33: DPS is a digested protein, it has the double biosecurity benefit of high processing temperatures and proteolytic enzyme treatment. It is highly unlikely that any viruses can survive the DPS production. Technical Bulletin 34: Pigs preferred a diet containing flavored DPS versus a diet with non-flavored DPS. Technical Bulletin 35: Determining the effect of adding two levels of flavoring (low and high level) to Dried PorSol 50RD (DPS 50RD). There was no indication that the higher level of flavoring increased the preference exhibited by the pigs. Technical Bulletin 36: Dogs showed a numerical preference for a ration with 2% CPS 21 added. In the second trial dogs significantly preferred a ration with 2% CPS Ultra 21 added. Technical Bulletin 37: Examining the performance of DPS 30, Plasma and Tryptophan on feed intake in low Tryptophan diets for piglets. Piglets fed diets with DPS 30 or Plasma had higher feed intakes versus a control diet. Technical Bulletin 38: The Japanese government conducted several tests to determine the digestibility and availability of nutrients in DPS for pigs. These results showed that DPS is a highly digestible product for swine. Technical Bulletin 39: A trial was conducted at the University of Idaho by Dr. Ronald Hardy to determine the apparent digestibility coefficient (ADC) of DPS for rainbow trout. It was determined that DPS 45SD is highly digestible and could serve a vital purpose in fish feed applications. Technical Bulletin 40: A canine palatability test was conducted at Kennelwood Inc. Champaign, IL in March 2000 to examine dog preferences for Condensed PorSol Ultra (CPS Ultra) versus a pork liver digest (PLD) product. Dogs showed equal preference for diets spray coated with PLD or CPS Ultra. Technical Bulletin 41: A feeding trial was conducted at the University of Minnesota, by Drs. Lee Johnston, Sam Baidoo and Jerry Shurson, to examine the effect of PorSol (DPS) on the performance of lactating sows and their litters. Sows fed diets with DPS 30 during lactation had a linear increase in ADFI versus the control sows receiving no DPS 30. Technical Bulletin 42: In a feeding trial conducted by a major United States feed company, pigs were fed diets containing DPS 50RD to evaluate the effects of replacing fishmeal or plasma on growth performance. Partial or entire replacement of spray-dried plasma protein with DPS 50RD in phase 2 starter diets did not significantly affect average daily gain, feed intake or feed/gain ratio. Although no significant differences between treatments were observed in phase 3, subsequent feed efficiency in phase 4 was significantly improved for pigs fed diets containing DPS 50RD. These observations suggest a positive carryover effect may exist for pigs fed DPS 50RD. Technical Bulletin 43: DPS 50RD was used in a 5-week nursery trial to evaluate its effectiveness on growth performance of pigs weaned at 20 days of age. Dr. Hans Stein conducted this trial at South Dakota State University (SDSU). Pigs fed diets containing 3.0 or 4.5% DPS 50RD had significantly higher (P<.05) weight gain and gain/feed than pigs fed the 5.0% fishmeal control, days 7-21. No significant increases in feed intake were observed, days 7-21. Therefore, these results suggest an improvement in gut health and perhaps nutrient uptake occurring in pigs fed DPS 50RD. Technical Bulletin 45: In a study conducted by 1DeRouchery et al at Kansas State University, commercially available specialty protein products were evaluated in a 14-day growth assay with 20 day-old pigs. Technical Bulletin 48: A 5-week study was conducted by Dr. Hans Stein of the University of Illinois to evaluate the effects of dietary mannan products on the growth performance of 20 day-old weanling pigs. Diets supplemented with UltraMannan 120 and UltraMannan 85 significantly improved piglet growth performance compared to pigs fed diets containing the competitor’s mannan product (Mannan B). Technical Bulletin 49: A 35-day, phase 2 nursery trial was conducted at Kansas State University, by Dr. Joel DeRouchey et al. to evaluate the growth performance effects of including DPS 52 in the diets of 15 to 25 lb. pigs. In this study piglets receiving diets containing DPS 52 had significantly improved ADG and feed efficiency, day 0-14 compared to piglets fed fishmeal. 1. The effects of DPS vs. other high quality proteins (fishmeal and plasma) on young pig performance. 2. The digestive enzyme activity and intestinal morphology of nursery pigs receiving various proteins (DPS, fishmeal and plasma). Technical Bulletin 51: Results show that the competitive sample contains 50-60% soybean protein carrier. DPS 50RD only contained 3-4% soybean protein carrier. This results in the competitive sample containing 40-50% peptone when compared to DPS 50RD at 96-97%. The price difference between the two products is clearly negated by the peptone/carrier concentrations.